The exhibits screen is used to enter the exhibits. Before an exhibit can be entered, there must be an exhibitor entered. To access the "Exhibit Screen", choose an exhibitor and click on Exhibits. 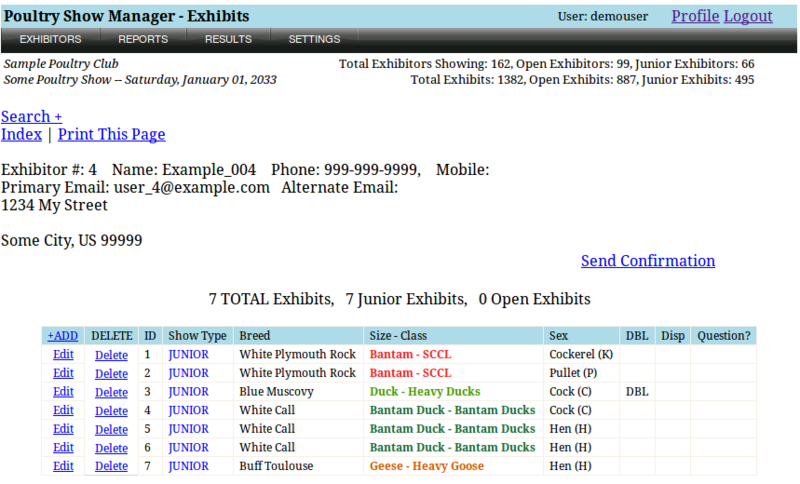 Multiple exhibits, of the same size, class, breed, and variety can be entered from the add exhibit screen. The entry screen is intuitive. Entries are color coded to help the show staff maintain and keep track of different shows sizes and breeds. The fields table is listed below. The system will prevent a dependent exhibit from being deleted. A dependent exhibit is an exhibit that has placement information entered. If an exhibit has placement entries and you accidentally hit the delete button, the application will not allow the deletion until the dependencies are removed. Breed & Variety Select the breed, & variety of the exhibit. To enter a Rhode Island Red just start typing "Rho" and the program will help you find the breed. Check Entry Place a check mark here if there is a question or if this entry needs additional information. 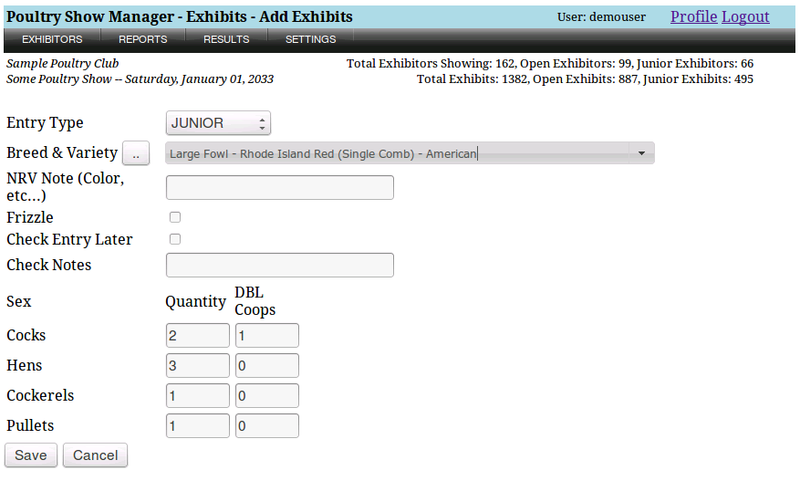 To add an individual or multiple exhibits click on the "+Add" at the top left corner of the Exhibits Table. The Add Exhibits screen will look similar to the screen shot on this page. An explanation of the fields are listed below. *1 Clicking the ".." button will toggle the type and search drop down for the breed. We recommend always leaving the search feature on. If a breed cannot be found, try typing the color first. If looking for a Black Breasted Red then type Black not BB Red. The breeds database is kept up to date for newly recognized varieties and contains all breeds and varieties listed in the current APA and ABA Standards. If there appears to be a variety missing, please contact us. We require proof that a breed or variety has been recognized before adding it. There are many terms that can be used to described Non Recognized Breeds and Non Recognized Varieties. When developing the software we chose to use NRV & NRB. All NRB & NRV exhibits will be listed in the Exceptions Report. The NRV Note will print on the Coop Card and Judging Sheets. When using our application a Non Recognized Breed is any breed that is not listed in the American Poultry Association (APA) or the American Bantam Association (ABA) Standard. A recently admitted breed can be added if proof of acceptance into the standard is provided. When selecting a NRB then the NRV Note must include the breed name and color or variety. The breed and variety information is to provide the judge, staff, and visitors information necessary to identify the breed. When using our application a Non Recognized Variety is any Non Recognized Breed or any variety of a recognized breed that is not listed in the American Poultry Association (APA) or the American Bantam Association (ABA) Standard. A recently admitted variety can be added if proof of acceptance into the standard is provided. When selecting a NRV then the NRV Note must include the color or variety. The variety information is to provide the judge, staff, and visitors the information necessary to identify the variety. To edit an individual exhibit click on the "Edit" link on the row to edit. The Edit Exhibits screen will look similar to the screen shot on this page. An explanation of the fields are also listed. Once finished editing the data, click on Save to save the entry. When editing exhibits, only one exhibit can be edited at a time. To delete an individual exhibit click on the "Delete" link on the row to delete. The application will ask if you are sure. If there are entries dependent on this exhibit, then the software will not allow it to be deleted until the dependencies are removed. If your show offers trios then software will allow you to assign birds to the trio. The assignment is nothing more than a way to assign exhibit number to the trio and provide a method to tag them on the coop cards, judging cards and instructions when finished.